Pets are not allowed on any portion of the Gulf front white sands of Panama City Beach ($500 fine), with one exception. A section immediately west of the Panama City Beach pier (across from Pier Park) is designated as a pet-friendly area. In other parts of the county you may walk dogs on leashes, including public beaches along the area bays. Are temporary “tent” structures allowed on the beach? The subject of temporary tents on the beach has been debated by city officials for some time now, but has now been resolved with an ordinance. Temporary “tent” type sun shelters may be used on the beach during the day, however they must be removed by 9 pm local time at night, then setup again the next day if you like. However, if the tent or any other personal belongings are left past 9 pm, they will be determined to be abandoned and can be removed by city crews. Long term camping on the beach is not permitted. 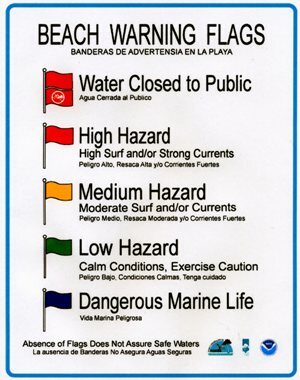 How do I know when it is safe to go swimming in the Gulf? IMPORTANT: If you are swimming in the Gulf and you find yourself unable to make it back to shore against the current, you will be likely fighting against an “undertow” or “riptide”, as it is also called. Don’t panic. Just start swimming parallel to the beach until you feel the current subside, then swim in to the beach. This is a very important thing to explain to your family and friends. How do I know which fishing boat to go on? If you want to go just a little bit offshore to give the kids a great little adventure, we recommend the 4-5 hour ‘half day” trips on the “Party” boats which offer fishing completely around the boat when it stops over a fishing site. Kids really love this and they are back in plenty of time for a fun night on Panama City Beach. For more serious fishermen, book an all-day charter on either another Party boat or lineup a private charter in the Gulf or a shallow water trip in our beautiful bays! Want to do your own thing? Fish off the jetties at St. Andrews St. Park or rent a boat at Grand Lagoon and catch your own dinner! If you have more questions e-mail us! How many golf courses are in the area? There many locally and many, many more within a one hour drive. Several beautiful courses are here waiting for you. May I drive on the beach? Sorry, no vehicles are allowed on the beach except authorized emergency personnel and cleaning crews. There are over 20,000 condos hotel/motel units (and more on the way), with something available in every price range. What is the sand like at Panama City Beach? Our sand is beautiful, known as some of the finest in the world! Our beaches consist of 19 miles of fine white powdery sand that in most places looks like pure sugar! If you really want to be alone with huge amounts of beach all to yourself, plan to visit Shell Island just to the east, accessible only by boat. There are several shuttles available. You can even rent your own boat!! What is there to do after a great day on the beach? Obviously, “Fun” is in the eyes of the beholder, from a round of miniature golf with your group to pier fishing at night! For example, after a great seafood meal you may prefer to sit and enjoy music. You can find just about any type of music you like. From a “50’s” group to country, blues, and several places offering karaoke where you can “do your own thing.” There are dinner cruises with dancing, as well as gospel dinner cruises. Some night spots and restaurants have DJ’s playing music while you just sit and visit with family and friends. What is there to do during a Panama City Beach vacation? the list goes on and on. Email us if you have questions! When is seaweed present on Panama City Beach? Across the entire Gulf Coast, from Panama City Beach to Pensacola, seaweed can occasionally be seen washing up on the beach. This can happen after the passing of a large offshore storm. It is not dangerous and usually it is not a not a big problem for swimmers or sunbathers in small quantities. However, if it is does arrive in significant quantities, crews will get busy removing it. You may also occasionally see in the summertime surf what the locals call “June Grass”. It is not dangerous and is not really a grass at all, but rather a light green algae that can be found in many places throughout the world. It is even found in Lake Michigan sometimes. June Grass is a summertime event and doesn’t last long. It usually disappears from the Gulf within a few days. Where are the good restaurants? restaurants you will see under the “Things to Do” section on our Home Page. That’s just SOME of them!